Consumer sentiment jumped at the beginning of June, moving opposite of expectations and heading back toward levels seen earlier this year. The University of Michigan’s Friday report on consumer attitudes about the economy hit 99.3 in a preliminary June reading, higher than the 98.3 expected by a survey of Reuters economists. The index was more than a point above May’s reading of 98 and rose to its highest level since hitting 101.4 in March. Consumers surveyed by the University of Michigan viewed both their current financial situation and the current buying conditions for household durables more favorably, according to chief economist Richard Curtin. “Greater certainty about future income and job prospects have become the main drivers of more favorable purchase plans,” Curtin said in a statement. 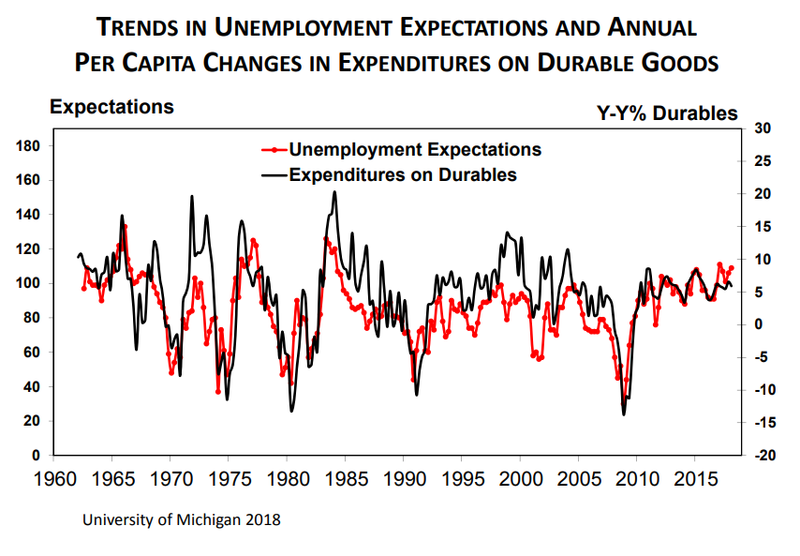 Curtin highlighted a chart showing the connection between how consumers’ expect unemployment to change and the current yearly per capita change for spending on durable goods.